Without the preserved stories and the ones who tell them, every building would just be something of brick and stones. It is the stories of the people of the past, who have lived, laughed, loved, cried, been born and died, which breathe life into these spaces and the storytellers who make sure the future does not forget them all. Today, Maribor castle is composed of two parts, the administrative court of the sovereign prince, built between 1478 and 1481, and the North-eastern corner of the city’s defence system (the castle’s bastion and the lodge). In 1620, when the Counts Khiessl gained ownership of the castle, they converted it to the nobleman’s residential architecture. At that time, the Loretto chapel was added to the castle and the Knights’ Hall was constructed. After 1727, the new owners, Counts Brandis, built the new staircase, reconstructed the first floor of the bastion and completed construction of the Knights’ Hall. With the construction of the present day street Grajska ulica in the year 1871, the castle complex was cut in half. 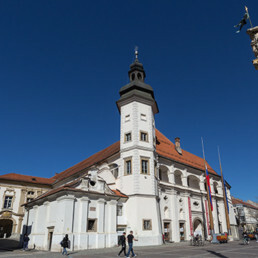 The municipality of Maribor bought the castle in 1933. 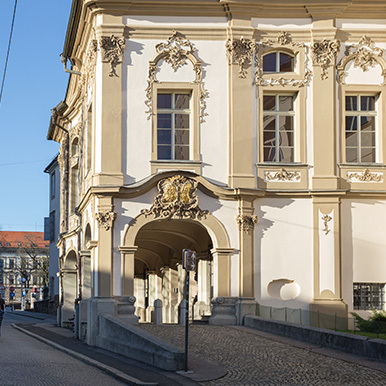 It was in 1938, when the Maribor Regional Museum moved its collections in. The castle bastion was built between 1555 and 1562 in line with plans by Domenico dell’Alia. In 1750, it was bought by the Brandis Counts, who extended it upwards and included it in the castle composition. In 2004, the filling was removed from its south-eastern corner. Since 2007, the exhibition Between the glamour and misery of the Middle Ages has resided on the ground floor. 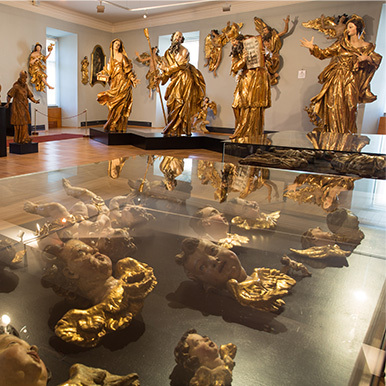 Since 2014, there has been a depot for the painting collection on the first floor, and since 2015 also a sculpture depot, which is accessible for viewing. In 1591, the cellar and two levels above it were built – on the first level, there was a kitchen and pantry, and on the second two rooms. Since 2010, the exhibition Ars pharmaceutica – The art of pharmacy has resided in the cellar. The castle cellar is part of the basement level of the administrative court that began to be constructed in 1478. It is adorned by frescoes painted in 1940 by Matej Sternen for the restaurant that was located there at that time. 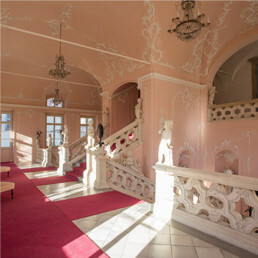 Prior to that, the walls were decorated with frescoes by Viktor Cotič. After World War Two, these premises were also allocated to museum purposes. Since 2006, the cellar has housed the exhibition Beginnings and since 2010 the exhibition First Touch. After 1620, the Khisl Counts built a hallway through the main castle, which facilitated a new access to the eastern courtyard. At the same time, the hitherto unified cellar was separated and its northern part, now referred to as the deep cellar, was newly vaulted. The castle staircase was built between 1747 and 1749 on the location of an older entrance hall with a staircase tower. It is renowned for its stone balustrade decorated with statues of sixteen young boys. The statues symbolise various disciplines, arts and economic activities. They are accompanied by allegories of the seasons, and the goddesses Ceres and Diana. The chapel was built in 1655 and modelled on the Santa Casa chapel in Loreto near Ancona. A niche in the presbytery contains a preserved statue of a Black Virgin and Child. In the northern part of the main tract of the castle, on the first floor, there is a room with partially preserved frescoes from the first third of the 18th century.  These depict groups of Chinese, playing various games. In 1680, the Khisl Counts built the Knights’ Hall. At that time, the ceiling was decorated with plaster stucco work by Alessandro Sereni, while the painter Laurenzo Laurigo painted a wreath of images around the central field. In 1763, Joseph Michael Gebler painted the central part of the ceiling. The castle loggia appeared on top of the town wall between 1668 and 1682. Count Hans Jakob Khisl covered the loggia with a ceiling that is supported by arcades. Around 1733, the loggia and the Knights’ Hall were connected by an arcaded gallery. In Maribor in 1478, upon the orders of Emperor Frederick III, an administrative court was built at the north-east corner of the town walls. It was intended to provide the town with stronger fortifications and better provision in the turbulent times of Hungarian and Turkish threats. The lower ground and ground floors of the court were arched and the upper floor had a level ceiling. The original height of the building is shown by the painted wreath made up of overlapping pointed arcs in the roof space. In the north-east corner of the walls a bastion was built, one of the four defensive constructions in Maribor, in line with plans by Domenico dell’Allio. The defensive strength of the bastion was increased by the filling in of its north-east part, which was removed in 2007. On the ground floor, five of the former six arrow slits have survived and below them are metal rings for securing cannons.  Judging by depictions, the upper floor also served for the placement of cannons. In 1750, the bastion was bought by Count Brandis and a residential floor was built upon it. The Khisl Barons (from 1623 onwards Counts, owners of the castle to 1686) began to transform the court into a residence when they inherited ownership in 1620. They built a hallway through the building, upgraded the four corner towers, of which only the south-east one survives, and after 1640 on the south and west sides built covered, arcaded walkways. On the west side a vestibule with a staircase tower was also added. The Loretto Chapel was built upon the orders of Jurij Jernej Khisl and consecrated in 1661 by Bishop Vaccano. A niche contains a statue of a Black Virgin and Child, and on the walls are the tall wooden candlesticks with the coats of arms of the Khisl Counts from the 17th century. The oratory added after 1727 was intended for the castle family. The preserved votive images show that the chapel was also visited by townspeople. On top of the town walls a castle lodge was built. Count Hans Jakob Khisl had roofing supported by arcades built over the east tract. The east tract was made up of stables for horses (before 1590), and the north a dairy pantry and storage place, with above them a meat store (1590–1591). The ceiling of the Knights’ Hall from around 1680 was decorated with stucco work by Alessandro Sereni and his assistants, while the painter Laurenzo Lauriga painted an allegory of the four seasons, the Roman gods Jupiter and Mars, scenes showing Odysseus’s return to Ithaca, and two battle scenes of the war against the Turks. In 1763 the castle painter Joseph Michael Gebler painted in the centre of the ceiling a scene of a battle against the Turks. 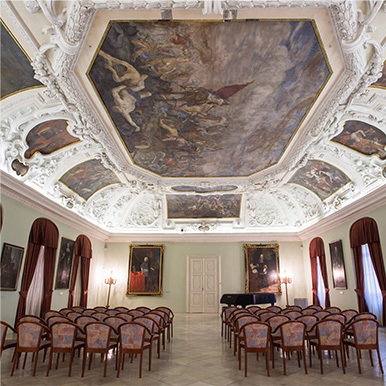 The hall has hosted some famous individuals, including Pope Pius VI (1781) and Franz Liszt (1846). 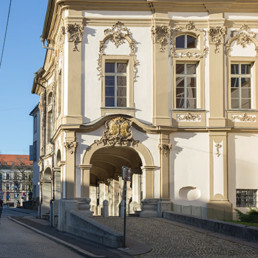 In place of the old staircase tower the Brandis Counts (owners of the castle 1727–1876) completed a new building as a festive entrance of the Knights’ Hall. The exterior is playfully varied and decorated with Rococo stucco ornamentation, as well as the allied coats-of-arms of the Brandis and Trauttmannsdorf families. The interior has a stone balustrade enhanced by stone statues (young boys symbolising various disciplines, economic activities and art, the goddesses Ceres and Diana, niches with allegories of the seasons), while iron lamps in the shape of tulips and sunflowers have also survived. 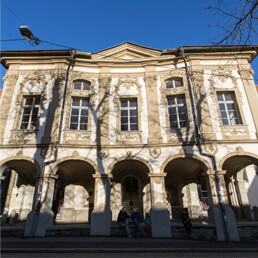 In 1933 the Municipality of Maribor bought the castle from Vilko and Berta Berdajs (castle owners 1921–1933) and in 1938 the Regional Museum Maribor moved in. The building was adapted for the needs of the museum and in the inner courtyard a raised walkway was built.